The trade figures between Sri Lanka and Myanmar in 2018 was around USD 80 million, Ambassador of Myanmar, Han Thu said yesterday. Health care, cosmetics, food and beverages, banking, IT and shipping are the main sectors fromSri Lanka that could to invest in Myanmar. The laws and policies in Myanmar enable foreign companies to carryout retail, whole sale and education business. It also enables foreigners to buy shares in local companies. Further more investors could lease lands for a period of 75 years which again increases the demand to invest in the country. It is also possible to establish a company in Myanmar within two to three months after all initial procedures are completed. The ambassador said that transport, oil and gas, power, real estate, manufacturing, tourism and mining are the main industries of Myanmar which are open for foreign investments. Singapore is the top most foreign investor of the country followed by China. Countries such as UK, USA, Korea and Malaysia have invested already in Myanmar. Furthermore, he said that the country mainly is concerned on improving the agricultural sector, manufacturing sector and the private sector in its long term agenda. Amid degradations in the recent years, Myanmar experienced a strong GDP growth in 2017 and 2018 which is from 5.9% to 6.7%. “This has been the fastest growth rate in the South East Asia region,” he said. Recently opened in 2011 after decades of isolation, Myanmar is a new target for the growth in Southeast Asia. With a large population and vast areas of the economy that is largely underdeveloped, Myanmar is almost a blank canvas for rapid expansion of its economy and companies involved in the country. After a historic opening of the country, the Myanmar government has cleverly maintained the country’s low taxes. Non-resident branch companies pay corporate tax at a rate of 35% while the companies incorporated under the Foreign Investment Law pay corporate tax at a rate of 25%. There is no VAT system in Myanmar. A Commercial Tax is imposed on a wide range of goods, imported into or produced in Myanmar, trading sales, and services. There is no commercial tax on the export of goods except for petroleum crude, natural gas and jade and other precious stone. 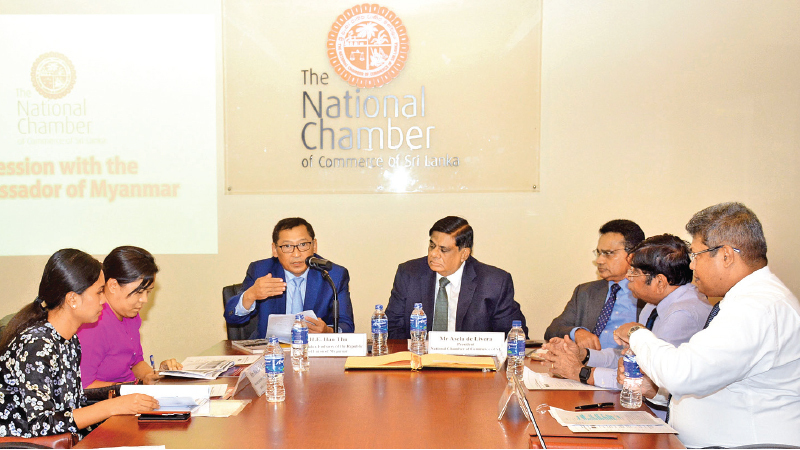 “Accounting for the long term relation between the two countries, the time has come to move from a cultural relationship to a trade relationship,” the Ambassador said and invited all interested Sri Lankan businesses to invest in Myanmar which in turn would bring about an economic growth for both countries.